Asthma is a lung condition that causes irritation and swelling (inflammation) of the lining of the airways in your lungs. The inflammation causes wheezing, coughing, and shortness of breath. Asthma is a chronic condition, which means you may have it the rest of your life. You may start coughing or wheezing when you breathe in irritants or something you are allergic to. Cold air, chemicals, perfume, and smoke are examples of irritants. Examples of things you might be allergic to, called allergens, are dust, pollen, molds, and animal dander. A cold or the flu might also bring on an asthma attack. Some people have coughing or wheezing only during or after physical activity. This is called exercise-induced asthma. Asthma may be mild, moderate, or severe. An asthma attack may last a few minutes or for days. Attacks can happen anywhere and at any time. Severe asthma attacks can be fatal. It is very important to get prompt treatment for asthma attacks and to learn to manage your asthma so you can live a healthy, active life. About 20 million Americans have asthma, and the number of people who have asthma is increasing worldwide. If you have asthma, the airways in your lungs are always somewhat inflamed, even when you do not have any symptoms. When your airways are exposed to irritants or allergens, the airways become more swollen and make more mucus. The tiny muscles in the walls of the airways contract. These reactions cause the airway openings to become smaller, making it harder for air to move in and out. Wheezing is the sound of air moving through the narrowed air passages. The extra mucus in the airways causes coughing. You may find that there are things you used to do that you can no longer do because of your trouble with breathing. A single attack of wheezing does not mean you have asthma. Some infections and chemicals can cause wheezing that lasts for a short time and then does not happen again. Your healthcare provider will ask about your history of breathing problems. You will have a physical exam. You may have one or more breathing tests. You may be tested before and after taking medicine to see how your symptoms respond to medicine. The goal of treatment is to allow you to live a normal, active life. Proper treatment can reduce your day-to-day asthma problems as well as the chance that you will have a bad asthma attack or more problems in the future. Treatment will probably include prescribed medicines and the removal of obvious allergy-causing substances or irritants from your home. Albuterol is the generic name of the most widely used quick-relief medicine. It is a type of medicine called a bronchodilator. 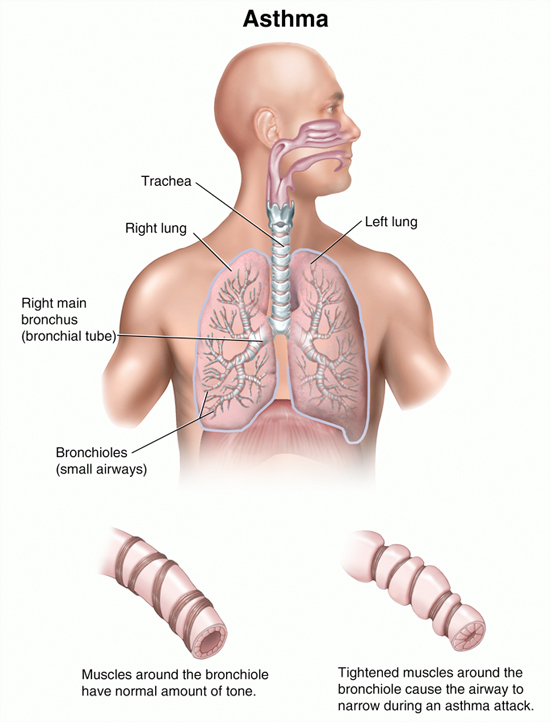 Bronchodilators relax the muscles in the airways. When the muscles are relaxed, the airways become larger, so there is more space for air to move in and out. You inhale the medicine by breathing it into your lungs as you spray it into your mouth. You use this medicine when you start to have an asthma attack. In some cases your provider may recommend that you use it on a regular schedule. You should always carry a bronchodilator with you to use when you begin to wheeze. If you have exercise-induced asthma, you should use the medicine before exercise to prevent wheezing. Steroids are another type of medicine that may be used to control asthma symptoms. They are a type of anti-inflammatory medicine that is often used for treatment of a bad attack that has not responded to other treatment. The medicine is usually prednisone and you are usually given between 4 and 10 days of the steroid tablets to take with your other medicines to get your asthma back under control. In addition to using a quick-relief bronchodilator when you have asthma attacks, you may need to combine different types of long-term control medicines for the best control of your wheezing. Several types of medicines help prevent asthma attacks. These medicines are now considered the best and safest way to have long-term control of asthma. They help reduce the inflammation in your airways. They are taken on a regular schedule whether or not you are having symptoms. Long-term-control medicine should be used all the time for year-round asthma. For seasonal asthma, your healthcare provider may instruct you to take a long-term-control medicine just during the months when you usually have asthma symptoms. The medicine does not work well if you start and stop it frequently, for example, every week or two. Long-term-control medicines cannot stop attacks of wheezing after you have started wheezing. You must use a quick-relief medicine, such as albuterol, when you are wheezing. let you have a fully active life, including participation in sports and other physical activities. a type of medicine called leukotriene modifiers, including zafirlukast (Accolate), zileuton (Zyflo), or montelukast (Singulair) pills taken daily. Some of these medicines are available as combinations. cromolyn or nedocromil, inhaled 3 to 4 times a day. If you have severe persistent asthma, your healthcare provider may prescribe low-dose oral steroids for long-term control of the asthma. This medicine may be taken as tablets or a syrup. You need to work closely with your healthcare provider to find the treatment right for you. Make sure you understand how to use each of your medicines. Some are quick-acting and meant to be used when you have an asthma attack. Others are slow acting and help prevent attacks but they do not help when you are having an attack. Make sure you know how to use your inhaler correctly. Some inhalers work best if you hold them 2 inches in front of your mouth when you spray. This helps the medicine get to your lungs rather than getting stuck in your mouth. However, for some inhalers you need to put your mouth on the inhaler. If you have an inhaler that should be used a couple of inches in front of your mouth and it is hard for you to hold the inhaler in the right position, ask your healthcare provider for a spacer tube. You can put one end of the spacer in your mouth and attach the inhaler to the other end. This allows you to breathe in slowly and fully and to inhale more of the asthma medicine. Be sure you ask your healthcare provider or pharmacist how your inhalers are supposed to be used. Read the directions that come with the inhalers. Also ask your pharmacist how you can know when your inhaler is empty so you can avoid getting caught without medicine. Your breathing ability can change from day to day. For example, illness or seasonal allergies may make your airways more inflamed than usual. Your healthcare provider may prescribe a peak flow meter. You can use the peak flow meter to measure how well you are breathing. It can help you and your healthcare provider know when you might need to increase your dosage of medicine to prevent severe attacks of wheezing. Asthma is a chronic condition, even though you might not have any symptoms for decades. Asthma is more common in children than adults. People who had asthma as children often have no symptoms once they become adults, but the symptoms may come back later in life. Asthma that develops for the first time in mid- or late life usually continues to be a problem for the rest of your life. Learn about asthma and its treatment. Learn to recognize signs and symptoms of an asthma attack. Many people with asthma either don't recognize their asthma symptoms or underestimate the severity of their symptoms. Pay attention to your symptoms and, if your healthcare provider recommends it, check your breathing with a peak flow meter. Work with your healthcare provider to develop a written asthma action plan. Following the plan will help you manage your asthma every day. It will help you recognize and handle asthma problems. Take your medicines exactly as prescribed. Always have your rescue medicine on hand and available. If you are taking a long-term-controller medicine, be sure to take it every day, just as your provider tells you. This prevents asthma attacks. If you are having wheezing even though you are using your controller medicines, let your healthcare provider know. Don't just stop them. If you are using both quick-relief and long-term control inhalers at the same time, use the quick relief inhaler first. Then wait several minutes before using the control inhaler. Learn what can trigger your symptoms and how to stay away from them. For example, you may need to cover your mattress, box springs, and pillows with zippered plastic covers. It may help to stay indoors when the humidity or pollen count is high. Avoid cigarette smoke. See your healthcare provider for regular checkups as often as recommended. Ask your provider if it is OK for you to take aspirin. Some people with asthma are allergic to aspirin and it causes them to wheeze. Aspirin is more likely to cause problems than other anti-inflammatory medicines, such as ibuprofen or naproxen, but sometimes they can cause wheezing, too. Acetaminophen (Tylenol) does not cause wheezing. Get a flu vaccine every October. sleeping with your head elevated at least 4 inches. Asthma can be a life-threatening condition. If your medicines do not seem to be working to keep you breathing comfortably, contact your healthcare provider. If you are having an asthma attack and using your albuterol inhaler has not relieved your symptoms, you must get medical care right away. This may mean going to the emergency room or calling 911.